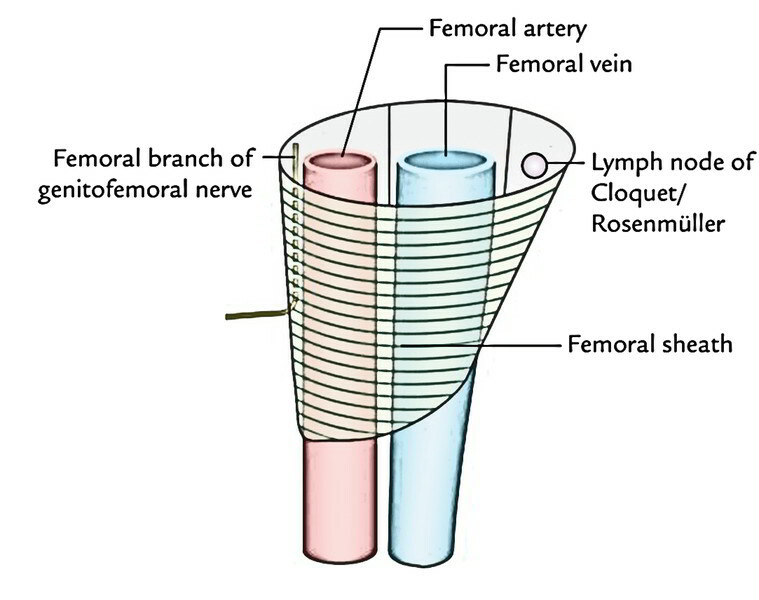 Femoral Sheath is the upper 3.75 cm of femoral vessels is enclosed by funnel-shaped fascial sheath. The abdominal cavity and apex unite with the tunica adventitia of the femoral vessels where the base of the femoral sheath is directed towards the upward side. 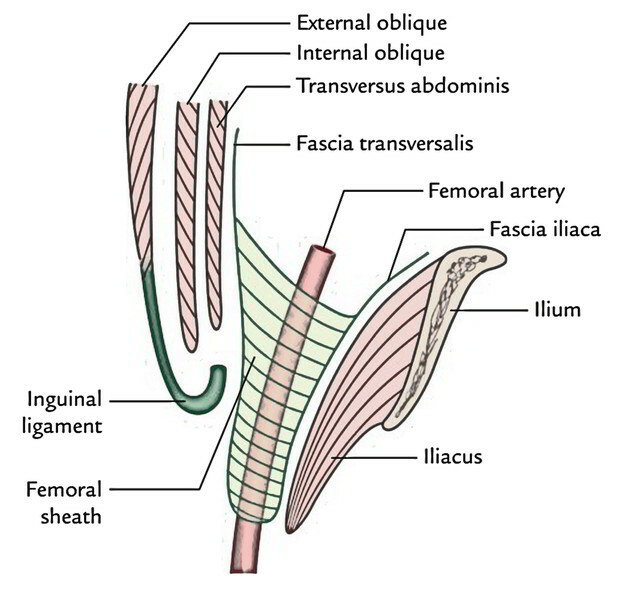 The downward prolongation of the fascia transversalis composes the anterior wall of the femoral sheath and by the downward prolongation of the fascia iliaca composes the posterior wall of the femoral sheath. The femoral sheath isn’t symmetrical. The lateral wall of the femoral sheath is vertical on the other hand medial wall of the femoral sheath is oblique being pointed downward and laterally. 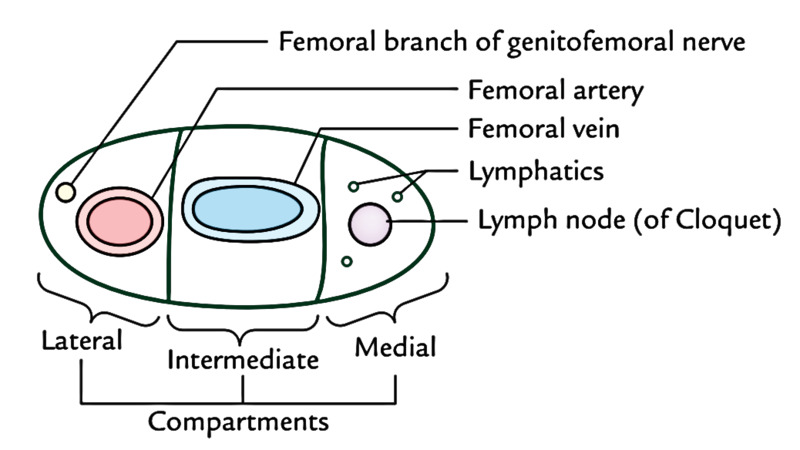 The interior of the femoral sheath is split into three compartments by 2 anteroposterior fibrous septa. Lateral compartment of femoral sheath lodges the femoral artery and genital branch of the genitofemoral nerve. Middle compartment of femoral sheath contains the femoral vein. Medial compartment of femoral sheath is comparatively empty and termed femoral canal. It includes lymph node of Cloquet and fibrofatty tissue. Into how many compartments does the interior of the Femoral Sheath Split ? Which compartment of the femoral sheath lodges the femoral artery ? How does the medial wall of the femoral sheath lies ?